The stainless steel gear units from SEW-EURODRIVE keep things moving wherever machines and systems are subject to particularly intensive cleaning. 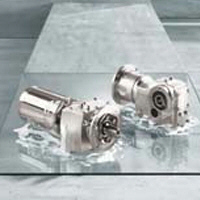 Regardless of whether the gear units are used for materials handling, intralogistics or hygienic applications, their hygienic properties, long operating life and maintenance friendliness make them optimally suited to the specific production conditions in the food and beverage industry, pharmaceutical industry, and in permanently wet environments. Efficiency-optimized KESA37 helical-bevel gear units and RESF37 helical gear units are characterized by their special housing design and the use of high-quality 304 stainless steel. The easy-to-clean surfaces are highly resistant against acids, alkalis, and corrosion. Recesses that can collect dirt and liquid have been eliminated as much as possible. NEMA and IEC adapters, also made of stainless steel, allow for variable motor mounting. The KESA37 helical-bevel gear unit is available in shaft-mounted design as hollow shaft with key, hollow shaft with shrink disk, and hollow shaft with TorqLOC®. The RESF37 helical gear unit in flange design can be ideally integrated into the machine. Purchase your SEW Eurodrive Stainless Steel Gear Units today!